Ballarat born Herbert L. Coburn grew up to be a renowned Ballarat architect, practising from 1905 to 1956. He taught Architecture and Building Construction at the Ballarat School of Mines (SMB) from 1922, resigning in 1948 due to ill health. in a letter to the SMB Council Herbert Coburn wrote: 'After having been in charge of these classes for 30 years ..., it is naturally disappointing to me to sever all connection with what to me has been a very interesting and pleasant association. The Royal Victorian Institute of Architects awarded Herbert Coburn a Silver Medal for design of an Anglican Gothic Suburban Church in 1913 while a student. In 1917 Coburn became associated with Percy Richards, and they formed a partnership in 1918 which lasted until 1933, at which time Herbert Coburn started his own architectural practice. 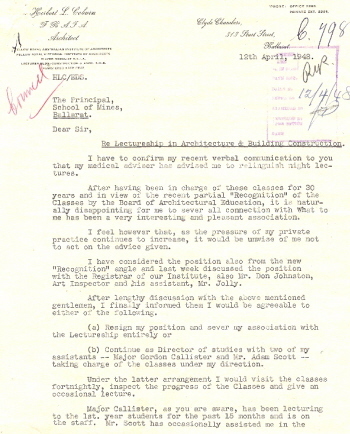 Coburn studied for formal qualifications by correspondence with the International Correspondence School, obtaining an architectural diploma two years later. His rooms were in the Clyde Chambers at 313 Sturt St, Ballarat. He was a Fellow of the Royal Australian Institute of Architects and the Royal Victorian Institute of Architects. The community minded Herbert Coburn was elected a Councillor with the City of Ballarat in 1938, and Mayor in 1945. Coburn's motivation was the 'proper development and advancement of his city.' Coburn held the position of Councillor until 1952. In 2008 a tour of some of the buildings designed by Herbert L. Coburn's will be conducted by the National Trust (Ballarat Branch) as part of the Art Deco Regional Festival.